The Frankfurt Book Fair draws people from around the world together to celebrate and sell books. This year, SCBWI Germany and Austria organized an AirBnB apartment for members to use as a home base and a workshop with literary agent Hannah Sheppard. Since the fair is too large for one person to dissect and analyze, I asked SCBWI members to write up their own experience of the fair. Enjoy! 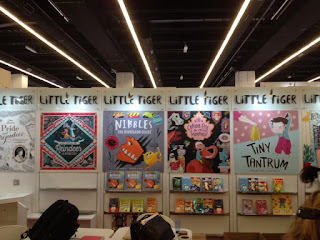 Having only been to the Bologna Book Fair last spring, a fair that focuses solely on children’s books, I was looking forward to seeing how “The Big Kids” played. And I wasn’t disappointed. First off, Frankfurt is the largest book fair in the world. There were four buildings to explore, one completely dedicated to books published in German. Sprinkled around the other buildings though, were publishers from every corner of the world, serving diverse markets from dictionaries to virtual reality apps. But foremost, Frankfurt is a rights fair. Millions of Euros worth of deals were made for books from all around the world. Which lends an exciting vibe to the fair, the thought that at one of the many tables around the fair, numerous authors and illustrators dreams of being published around the world were coming true. What was also different and perhaps more “adult” about Frankfurt from the Bologna Fair is the number of talks given at every minute of the day. Not only by authors or publishing experts, but also on political topics such as Thinking Alternatives: Visions on the consequences of the refugee crisis on Europe. Or Populism in Europe – the Role of Art and Culture. Both of which I found extremely interesting. 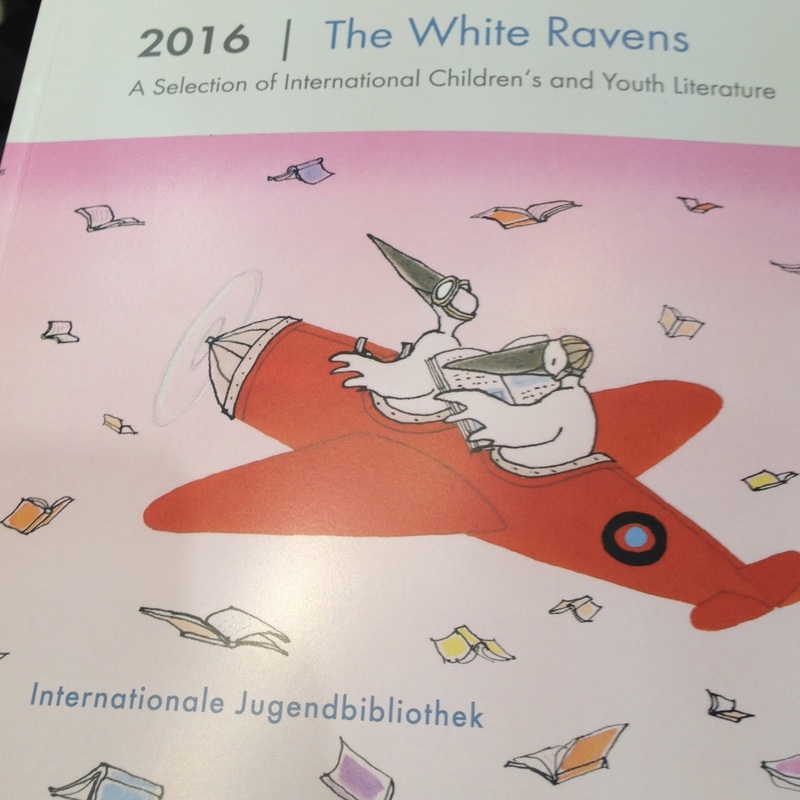 Another talk I enjoyed was the presentation of The White Ravens list of the best international children's and youth literature. A list compiled by the International Children's Library in Munich. But without a doubt, the highlight of my visit was the chance to hear Nujeen Mustafa, a young Syrian girl with cerebral palsy who has lived her entire life in a wheelchair talk about how she and her sister fled the violence in Syria and came to Germany. On foot! And I realized that I still have so much to learn, not just about publishing and writing, but about life in general. And isn’t that what good art is supposed to do? Make us question everything we know? I think so. It was my first time ever to visit a book fair and a rather spontaneous idea. I wasn't disappointed at all. If anything, I was overwhelmed by the sheer size and number of displays at the fair. Having only one day to spend, I could not possible see it all. Best thing though, was meeting up with fellow writers, bloggers and book-lovers in RL. Many I knew only via Facebook or SCBWI Pages, but now we met in person. I will definitely consider going again next year. In my German village—as charming as it is—there aren’t many people writing children’s books in English. Recently, I’ve collected so much information, but opportunities to process with other writers are rare. So I really enjoyed connecting with other SCBWI writers in real life. I hadn’t met most of them in person and they were delightful! Some of us met twice in two weeks because we were at Dan Wells’ free workshop in Stuttgart and met up again at the Frankfurt Book Fair. Speaking of opportunities, I admired the way our Regional Advisor Patti Buff stepped up and engaged with people to find speakers for SCBWI events. Go Patti! One person she engaged with was Jude Evans from Little Tiger Press who gave us a sneak peek of picture books coming out in 2017. These beautiful works of art reminded me again of the value of physical books. A bookmaking workshop reminded me how important play is when you make things. Hall 4.0 is full of companies that provide the raw materials for physical books. At the bookmaking workshop, you got to choose a piece of leather from an amazing selection. Second-year students from the Gutenbergschule in Frankfurt taught the double figure eight binding stitch. I never knew you held the awl at a 45-degree angle to punch the holes through the paper and the leather. It’s much easier than hammering a push pin through a bunch of pages. Not that I ever tried that. The Fair is overwhelmingly big and there’s so much information coming at you that it helps to have a fun and concrete goal. Mine was to get a Langenscheidt’s bag from the heart of the busy German-language Hall 3.0. When I studied in Germany, my Langenscheidt dictionary was my trusty companion. I scored one of these screaming yellow bags with the giant aqua L after three years of trying. The triumphs of life. At a panel about translators, an English-German translator who does children’s books said you get to know the author by translating and that you become friends because you have to understand before you can translate. It was so fun to have dinner with writers and speak English and talk about everything from American elections to immigration and how Americans describe their own national narrative. Our SCBWI visit to the Frankfurt Book Fair was fun and refreshing. I feel inspired to write engaging books and try them in different channels, but I’ll also be watching to see what my SCBWI writer friends are up to. If you missed the Fair, stay tuned; another NRW Scrawl Crawl is coming up Saturday December 3th, 2016, 10-12 AM. For more about the Fair, see my post at The Winged Pen. 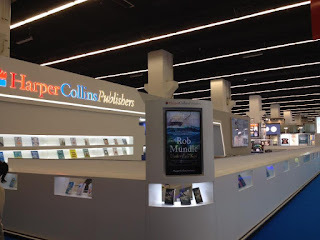 It was my first visit to Frankfurt Book Fair and as an accredited blogger I was very excited to get a press pass. My main reason for going was to meet the publishers who send me books to review on Story Snug and to browse through their new titles. It was also useful for my own writing and interesting to see where my picture books could fit into the market. 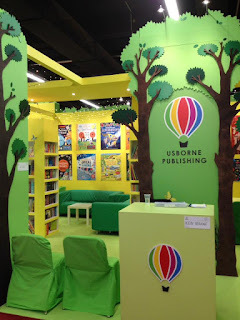 My first impression of the Book Fair was Usborne Books’ beautiful green stand; at that moment I felt like a kid in a sweetshop and didn’t know where to start looking first. Thanks to the Frankfurt App I had a good idea of where the people I wanted to see were located and I knew which talks and events I wanted to attend. A tour of international children’s publishers at the beginning of my visit helped me to get my bearings and then I just browsed and talked to various publishers, it was also great to spot books by SCBWI members. It was fun sharing an apartment with SCBWI Germany/Austria members, seeing old friends and meeting new ones. Hannah’s submissions workshop gave us a chance to think about our own writing and although I was only away for a night it still feels that I packed a lot into those two days. I hope that we can do it all again next year! The Frankfurt Fair this year was considerably more relaxed. What struck me immediately is that people were dressed much more casually than in previous years (I didn't see any $2,000 suits or outfits, which used to be the norm). All in all, everyone was more approachable. There were only a couple of people who were clearly too stressed-out to talk with me, and under those specific circumstances it was understandable. There was only one publisher who has a closed-mouth policy, in that they don't allow anyone - not even their hostesses - to make any kind of statement. The publisher-reps only speak with those who have made a previous appointment. Everyone else I approached was allowed to speak to other people - even others of The Big-Five. For me personally, this was the most fun book fair. I've never before been greeted so warmly and with such interest by other publishing professionals. It was really great to meet other SCBWI members, people who I had either met in Bologna or whose names I previously had only seen on my computer screen. That makes it even more fun, and honestly, much more laid-back. The scale of Frankfurt never fails to impress me. What's changing is the number of indie and self published people who are joining in the fair - and ultimately, changing it for everyone. Even The Big Five. Even though I've lived in Germany for five years, I've never attended the Frankfurt Book Fair until this year. I just couldn't wrap my brain around how spending that money and time would benefit me as a writer, since much of the fair is about selling foreign rights (or so I thought). I'm so glad I went! It's not beneficial in the ways I normally look for... meeting agents and editors (though we did meet a sweet agent at a workshop in our Airbnb) or attending workshops that directly impact my writing. It was beneficial in the way of connecting myself with the global industry of writing and publishing. It was MASSIVE. I spent hours on the children's lit floor and could have spent many more. There's also a whole section on self-publishing, which I've done with one book for adults now and I loved connecting with that part of the industry as well. My favorite, of course, was spending the time with other SCBWI writers and illustrators, chatting over dinner, snatching Dan Wells for dinner, and the moments in between where we share life, our work, and meet face to face. I chose to only spend a few hours of one day at the fair... in the future, I would definitely go for a few days and take my time soaking in everything that's available there. I attended only on Saturday. Since the Frankfurt Book Fair is gigantic, I didn't get to see everything. I spent most of my time perusing the English children's books to see what topics/books are new or popular at the moment. It is so beneficial to know the market. I also had a pleasant conversation with the representative at the Highlights for Children booth, watched an authors panel, met some new SCBWI friends, and even bought a few books for the bus ride home. It was a very long but enjoyable day. Thank you everyone! 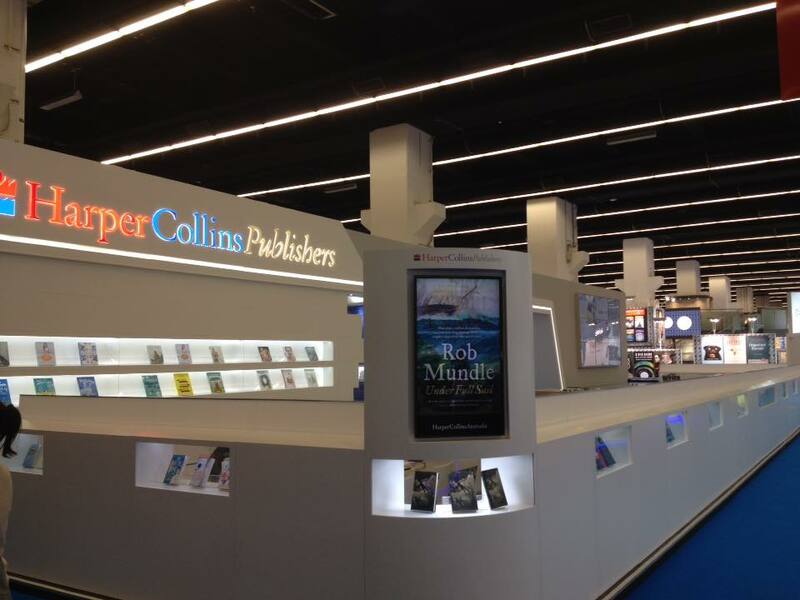 As you can see, the Frankfurt Book Fair is a varied as the books being published every year. Below is the official video of the fair I thought you might enjoy. I hope to see more members and members' books there next year!